Every now and again, someone comes up with an idea which is deliciously simple yet rather useful. 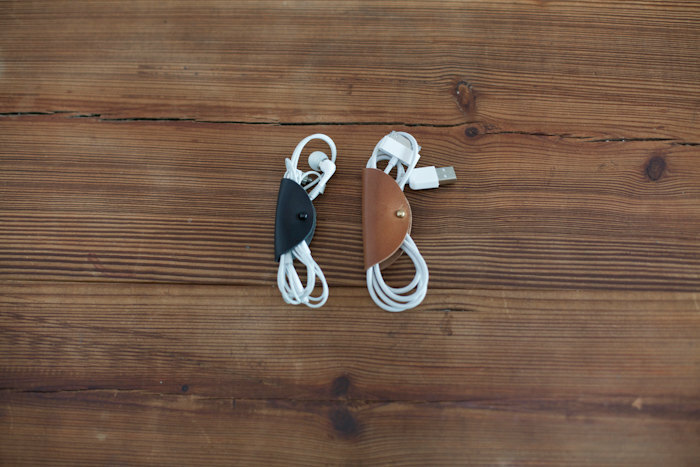 Meet Cord Tacos: a folded piece of leather with a rivet through it. Yep, that’s it. The rivet acts as a kind of button, so you can unfold the leather, insert your cable and then clip it in place. No more cables getting tangled at the bottom of your bag, and much more elegant than the rubber bands we OCD types use to keep things tidy. The review bit: they work. The cables are held securely, and the rivets don’t come undone. My only complaint is that the standard 5-pack comprises two large (suitable for USB leads and the like) and three small. The small ones are really only useful for earphones, and who carries more than one set around? Which gets you three usable Tacos for $30 with shipping. A little steep, but a lot prettier than an elastic band. Available on Etsy.